The 2018 Marucci CAT 7 is the same as the 2017 Marucci CAT 7. Marucci doesn’t hide this idea. They release their performance bats on a two year cycle. However, each year they do add a few models to the line. In 2018 they added a drop 10 to round out their drop 8, drop 5 and drop 3 (BBCOR) versions of the CAT 7. Generally, the bat gets very high marks from us (and users). After hitting with every version of the 2017/2018 Marucci CAT 7, multiple … Jump to the full review. We aren’t the only ones to have information about the CAT 7. Other places, in particular those who sell bats, usually have a boiler plate write up on the specs of a bat. Many of those we reference to make sure we are seeing what we should be. Here are some more references for the 2018 Marucci CAT 7 review. However, each year they do add a few models to the line. In 2018 they added a drop 10 to round out their drop 8, drop 5 and drop 3 (BBCOR) versions of the CAT 7. Generally, the bat gets very high marks from us (and users). After hitting with every version of the 2017/2018 Marucci CAT 7, multiple times with multiple hitters, here is our full review. As a general recommendation, we think the BBCOR CAT 7 is made for the gap hitter that likes the stiff feel of a single piece bat more than the soft crush of a two piece stick. Here’s who this fits: You want the best metal bat Marucci makes; You prefer a good value purchase on a performance bat; A durable bat that can last a good season or two is on your short list of features; Your stat sheet is filled with singles and doubles and a high AVG. On the other hand, those who want an end loaded bat, prefer the more buttery smash of a two piece bat or want a composite barrel should look elsewhere. The BBCOR version of the Marucci CAT 7 for 2018 or 2017 comes highly recommendable by us. In terms of value, we think it one of the, if not THE, best bat for your buck. We love the tapered knob, large barrel, loud ping and smooth smash on hits and mishits. We’ve seen hundreds of at bats with the CAT 7 BBCOR and can’t remember a single player who didn’t say anything but good things. Marucci has explained they will not produce a USA Bat in any of their models. That includes, obviously, the CAT 7. The reasoning is simple enough, they don’t want the first experience a youngster has with a Marucci bat to be poor. And they beleive the USA Bat standard is generally a poorly thought out idea with bad reasoning and execution. As such, they have not produced a CAT 7 in a USA space. As of this writing there is no intent to change that. 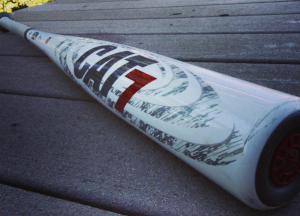 The Drop 5 might be the best Marucci CAT 7 bat in the line. Single piece aluminum bats tend to benefit from more weight and the 1.15 USSSA Stamp gives it maximum pop. If you can swing this bat, both physically and legally, we highly suggest you get one in your hands. Few ever go to anything else. For the longest time, the Drop 8 Marucci CAT 7 was the lightest swinging version you could ever get. When they didn’t have the drop 10 that they added in 2018, the claim was the drop 8 swung more like the drop 10. This wasn’t perfectly accurate, the CAT 7 Drop 8 has a swing weight more in line with other light swinging drop 8’s and 9’s. The counter-balance weight in the knob (from the anti vibration feature) didn’t offset the actual added weight of the bat. In terms of construction there is no difference in the 2017 CAT 7 vs the 2018 CAT 7. They did add the drop 10 version as well as some limited edition version (as we mention above). Marucci makes no bones about it being the same bat. As a site that reviews bats we can appreciate this approach as many companies are often guilty of changing the paint job and calling it something else. Not with Marucci; the 2017 CAT 7 is the 2018 CAT 7. Marucci uses this two year cycle on all of their performance baseball bats. JustBats purchased the exclusive rights to the CAT 6. That is, the updated look on the CAT 6---with the red base and white accents---is a JustBats only bat. The expectation, as far as we understand it, is that such will be the case indefinitely. Making such an arrangement, as far as know, a first. Does anything really compare to the CAT 7? A big barrel in a single piece aluminum is hard to come by. And the added unique know with its sting dampening skills makes it hard to find an equal. The CAT 7 also prices out above most single piece aluminum bats anyways. If you we had to shoot for something in a similar class then take a closer look at the Omaha 518 from Slugger. Both bats have stiff feels, decent sized barrels and come in a number of sizes. Or, maybe, the 2017 VELO from Rawlings. That Velo will swing lighter than the Cat 7, but its worth a shot if you’d like something with a lower price point. Looking at the Posey Metal 28 is cheating. That bat, in BBCOR at least, is the same as the CAT 7 with a different paint job. In the last two weeks, we’ve spent at least 2 hours reading player reviews, company literature and vendor takes on the new 2017 Rawlings VELO. Single Piece Aluminum: Single piece aluminum bats are, just that, single pieces of aluminum bats. They are made of one single piece of an aluminum alloy from knob to end cap. Barrel Size: The Barrel on the CAT 7 is 50% longer than the barrel on the CAT 6 due to a change in the taper of the inner barrel. Simply, the insides of the barrel are thinned out to 7 different levels that help increase the length of the barrel without messing with the swing weight. The 7 thickness levels of the inner barrel are a coincidence in the name CAT 7 (which refers to hurricanes). Knob: Inside the knob of the CAT 7 sits a small rubber piece. This piece is designed to lessen the vibration of the bat on mishits. Marucci has some studies that prove this is true. Our experience proves to us that it is also true. The bat fees better on mishits than other single piece aluminum bats. The CAT 7 comes in nearly every baseball bat size you can image. When it was first released in 2017 it came in a BBCOR, Drop 8, Drop 5 and Junior Big Barrel (JBB). The JBB was a drop 10 in a 25, 26 and 27-inch version. In 2018, the CAT 7 comes now in a Drop 10 as well as a few limited editions. As well, the Posey28 Pro Metal bat in BBCOR is a CAT 7 reprint too. Expand below to see more details on the type of bat you are looking for.